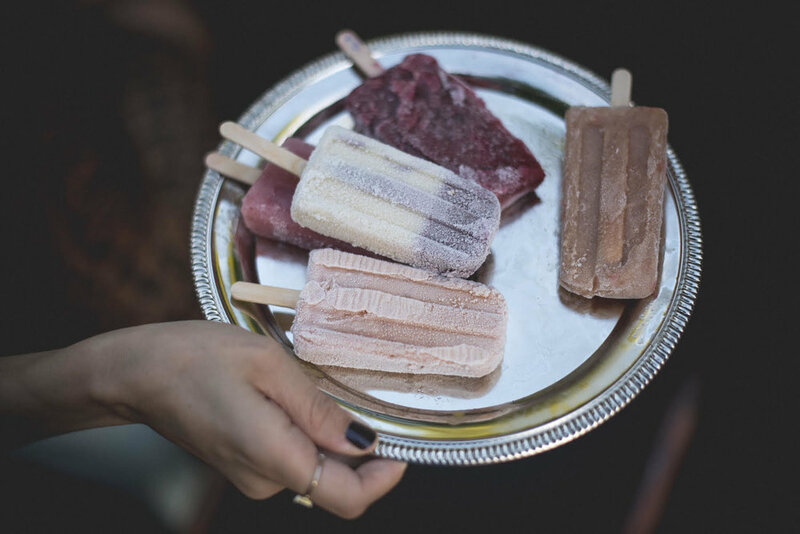 Inspired by all the master recipes and delightful flavor combinations in People’s Pops Cookbook, the stands at our farmers’ market, and our favorite summer cordials, here are three tried and tested boozy popsicles to celebrate the kiss of the summer sun. In order to counteract the natural dissipation of the alcohol that happens during the freezing and storing process, we put extra booze into a mister and allow guests to refresh their own popsicles as they are enjoyed. • Pulse puree mango until chunky. Transfer mango puree to bowl and mix in simple syrup, mescal and lemon juice to taste. Stir. • Pour the mixture into ice pop molds, leaving a little room on top for the mixture to expand. Insert wooden sticks and freeze until solid, 4-5 hours. Unmold and transfer to plastic bags for storage or serve at once with mescal mister. • If the peaches are at the height of their ripeness, there is no need to roast them, the flavors will be brighter if using raw. • Remove and discard pits and blend peaches with skins until chunky. Transfer peach puree to bowl and mix in simple syrup, St. Germain and lemon juice to taste. Stir. • Pour the mixture into ice pop molds, leaving a little room on top for the mixture to expand. Using a skewer or chopstick, press edible flowers into the sides of the mold, trying to maximize contact with mold. Insert wooden sticks and freeze until solid, 4-5 hours. Unmold and transfer to plastic bags for storage or serve at once with St. Germain mister. • Preheat the oven to 350degrees, Place the peaches cut side down on the cookie sheet. Bake until the skins and flesh have softened, remove from oven and let cool. • Remove and discard pits and blend peaches with skins until chunky. Transfer peach puree to bowl and mix in simple syrup, Sauternes and lemon juice to taste. Stir. • Pour the mixture into ice pop molds, leaving a little room on top for the mixture to expand. Insert wooden sticks and freeze until solid, 4-5 hours. Unmold and transfer to plastic bags for storage or serve at once with Sauternes mister.